For this year's last basics post, I thought I'd give any of you, that may be considering some paper crafting as an endeavour for 2011, a friendly nudge. 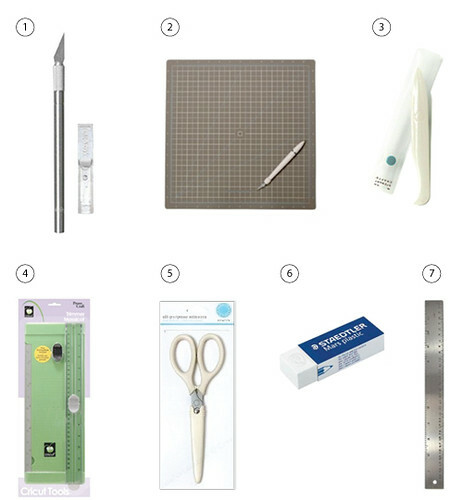 The following is a list of what I consider of must haves for basic tools—the very basic. This doesn't mean it is necessarily right or complete for you. I don't think there can be a list that suits all tastes and budgets, so I'm just going with what I have and use on an almost daily basis. Feel free to edit or add as needed. Craft knife — This is by far my most important tool of all. I have the very basic one—nothing fancy needed here. I also have a hefty supply of replacement blades on hand. Like I've said before somehow the cover always gets lost. Remember my storage solution (last photo here)? Cutting mat — This is about as important as the craft knife itself. I used to prefer white cutting mats but since using the Martha Stewart mat I find it easier to work with the contrast of the color of the mat with the white paper I'm so fond of using. Bone folder — I've always considered the final presentation of a piece to be very important and the bone folder is an excellent tool to achieve that. I have the Martha Stewart version and a plain common bone folder too. They both work fine. Paper trimmer — In the past I would've never thought that I'd include this tool as an essential item but after using one I don't think I could ever work without one—and I just use a very basic one. I can't imagine what I'd feel about getting the really heavy duty types that are out there (drool!). This is the trimmer I received with the Cricut—the added option of scoring of this trimmer is also handy. I'd prefer something more neutral in color—white? (yes, I'm picky like that—but not picky enough to let this one go to waste). Like I said I'm just showing you what I have. 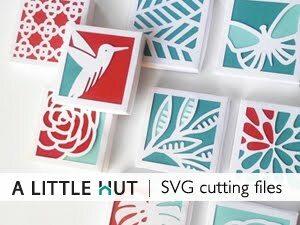 Scissors — I admit that scissors were not my first choice when I started my paper crafting experience. It took me a long time to finally use them on a more regular basis. I only use basic all-purpose scissors because I still use a craft knife for most of my paper cutting. It may be something small, but I'm particularly fond of using the protective cover that the Martha Stewart scissors have and unlike the craft knife cover this one hasn't gotten lost yet (crossing fingers it stays that way). Pencils & erasers — The eraser I use is very soft and doesn't leave any streaks. Sometimes I use the block eraser (great for carving small stamps too) but sometimes I like to use a stick eraser . I didn't picture pencils simply because I use very basic mechanical pencils. I like them because they are always sharp and I can make measurement marks more accurately. Stainless steel ruler — I have 6", 12" and 24" rulers and I just use them according to the size of paper that I'm working with. I don't like the rulers that have cork backs because I like to be able to slide my ruler across the paper freely. Other tools — There are so many others that I use regularly but are not what I would classify as basics are: paper punches (simple to more elaborate ), quilling tools , a corner punch , carving tools for block printing, brayer , baren and tweezers (excellent tiny tip on these). I may cover some of these in future posts. This list is simply a guide. You should use what you feel comfortable with (brand, price and/or style). For example, maybe you do prefer the stability that a ruler with cork offers. It's all a matter of working style, budget and willingness to have more items take up space in your craft area. I've toyed with the idea of getting other gadgets but a resolution for the new year is sticking with what I have and I really don't need any extras—so that's that. I hope this helps and as always, if you have any questions just ask away in the comments section and I'll be happy to help however I can. What are your must haves? Do you use anything that I didn't include here? Disclosure — I've mentioned this previously, but since this post has so many links, I'd like to readdress the fact that I have an affiliate account with Amazon. I receive a modest (trust me, really modest) amount for every sale that is made through my links. I only recommend or link to products that I really do use or can recommend without reservations.